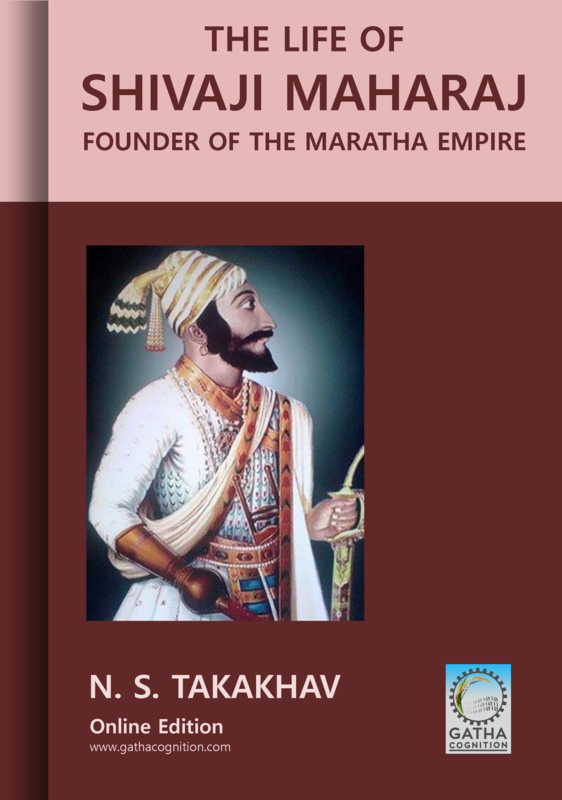 ‘The Life of Shivaji Maharaj: Founder of the Maratha Empire’ is the story our national hero. Revd. Dr. N. Macnicol M.A., D. Litt., a distinguished missionary scholar of the United Free Church of Scotland Mission stated in his forward to this book that “Shivaji belongs to no class or caste; he is a national possession. He may be said indeed to have come to rebirth in the hearts of his countrymen, not of Maharashtra alone but of all India”. Prof. N. S. Takakhav, M. A., adopted originally worked by Mr. K. A. Keluskar and referred original sources of information used for this work. Dr. N. Macnicol has corrected proofs of the first edition. We are cordially happy to make this Online Edition of this Global Possession for Global Community. Dr. Kiran Jadhav, the Editor contributed academic values to this critical task. The book is arranged in chapters to navigate easily in HTML format using all electronic devices and PDF will be useful to take printouts. At a time when the whole of the Indian Continent is entering upon a new phase of political life and bold schemes of social and political re-construction are being daily pressed for acceptance, no apology would seem to be necessary for the publication of a new life of Shivaji. For among the glittering multitude of mighty kings whose names adorn the pages of Indian History, the name of Shivaji stands forth in bold relief as the author of a momentous national revival that changed the destinies of India. And this is a fact allowed by all historians, even though the editors of the Rulers of India Series have chosen to ignore him and denied him a place in their Series, while including many other “Rulers” who were more or less mediocrities, when compared with the great Shivaji. If ever in the pre-British period of Indian History, there was anything that might be compared with the great national movements of Western countries, it was the political movement which laid the foundations of the Maratha Swarajya. And that movement would have been utterly destitute to all its national glory and significance, were it not for the genius and originality of one master mind who presided over the whole event, built a nation out of chaos and breathed life and purpose into the dead clay and disjecta membra of Maharashtra society and institutions. Such a man was Shivaji. Of the empire which he built up, only a few fragments have escaped the ravages of time. The rest has crumbled down and gone the way that all great empires in the world have gone. But the spirit of it has remained behind. He has left no pyramids, no rock-cut temples, no inspired by the stirring events of the late war, when the Maratha soldiers were called upon to display their native valour on the battle-fields of the West, this work was undertaken at the special request of the author of the Marathi original, as a grateful tribute to the genius of the founder of the Maratha nation. At the time when this work was undertaken, there was no worthy biography in the English language of the life and career of the great King who during the night of Mahomedan despotism dreamt the dream of national independence and realized it. It seemed a standing reproach to the Indian community, with their newly awakened political consciousness, that there should be no biographical record, commensurate with the greatness of the national hero, in that language which has done more than anything else to unite us into a nation and stimulate our national aspirations.architectural marvels to attest his greatness. But the name of Shivaji still lives to kindle and inspire the growing manhood of Maharashtra. This English version was taken in hand about seven years ago. As the work proceeded it was found necessary to make considerable alterations in the original Marathi text of Mr. Keluskar’s Life, as published in 1907. It was found necessary to take notice of the mass of new material and discoveries which have accumulated in the course of the last fourteen years. In its final draft the present English version has practically become a new and independent work and has already served as a basis for the second Marathi edition, which in a revised and considerably enlarged form, as compared to the first edition, was published by Mr. Keluskar early in 1921. This work has been thoroughly revised and retouched from time to time during the last seven years. It is quite up-to-date, so far as our knowledge of Shivaji and the men and things of his time extends and the conflicting theories that have been proposed as regards the purpose or policy for which he strove and the men of wisdom or action who counselled or co-operated in his plans. While the preparation of this work was in its various stages of progress, three important English works on Shivaji appeared in print, one of which has already gone into a second edition. Some explanation would seem to be necessary to justify the publication of a fourth work on the same subject. The first and obvious answer is that none of these works can be called a faithful biography of Shivaji, that is to say, a biography which is at once full and exhaustive and traces the development of his life-work from beginning to end in chronological order. The work of Mr. Kincaid reviews the work of Shivaji as a fragment of the History of the Maratha People, that of Prof. Jadunath Sarkar discourses upon “Shivaji and his Times” and often forgets the hero while discoursing upon his “Times”, that of Prof. Rawlinson is avowedly a monograph, too meagre in its scope to comprise the life-work of a great her like Shivaji. The thanks of the Maratha reader are due to all these scholars for the new light they have thrown on many obscure points in the life of their national hero, and to Prof. Rawlinson and Mr. Kincaid in particular for the generous way in which they have interpreted the motives and character of the great King. The earliest of this triad is the Life of Shivaji by Principal Rawlinson. It is a generous appreciation of Shivaji’s work and character. But the monograph, besides being too meagre in size for the magnitude of the task, devotes a good deal of its contents to discussions upon somewhat irrelevant topics. The impression that remains after a perusal of the book is that the author’s purpose is to show that the new era of Shivaji after all inaugurated a new type of bureaucracy, and the author seems to suggest that from the times of Ashoka and Chandragupta down to present times, the bureaucratic form of government has prevailed in India and must inevitably prevail for all time. The author forgets that there are bureaucracies and bureaucracies and that a bureaucracy with a Shivaji at its head ceases to be a bureaucracy, both in form and substance. Mr. C. A. Kincaid, who writes in collaboration with Rao Bahadur D. B. Parasnis, has devoted some 170 pages of the first volume of his History of the Maratha People to the story of Shivaji. The authors have taken little notice of the stirring events of the career of Shahaji and have chosen to ignore many a controversy which has caused an acute tension of feeling among scholars. This history is full of legends and folklore tales and apparently attaches as much importance to them as to matters of serious history. Its highest virtue is its picturesqueness. Although Mr. Kincaid has repeated the orthodox version as to the date, when Shivaji enrolled himself as a disciple of Ramdas Swami, it is some consolation to think that Mr. Kincaid has not allowed the infatuation of the Ramdas cult to blind him to such an extent as to ascribe to the preceptor the credit of Shivaji’s glorious achievements. He has had sense enough to see, as some patriotic and over-zealous Maharashtra scholars have not that such a representation of the relations between the preceptor and the disciple would reduce the national hero to a mere puppet. The supreme merit of Mr. Kincaid’s work is his enthusiastic and unreserved admiration of the Maratha people. Prof. Jadunath Sarkar’s “Shivaji and His Times” is the last of this triad. It is a noble work marred with strange flaws. Mr. Kincaid’s History and Prof. Sarkar’s Shivaji stand at two opposite extremes of historical method and style. The one is romantic in conception and uncritical in method, the other is hypercritical in method and sceptical in its intellectual outlook. The merits of Sarkar’s work are great. He has had access to a wealth of Mahomedan and British sources and authorities, the very existence of which had not been previously suspected. The fundamental fault of the work is that it appears as an overflow of the vast amount of historical material he had collected for his monumental work upon Aurangzeb. His sympathies are with the Moguls and the commanders of the Mogul empire. His sympathies are with the British factors at Surat and Rajapur. His sympathies are anywhere except with Shivaji and his gallant companions. Shivaji has fallen into the back-ground. Sarkar’s paeans of praise are poured forth in unstinted measure, now in honour of Shaista Khan, now in honour of Jay Singh. He conducts his reader into the Mogul camp, he brings him in the wake of the Mogul armies and the Mogul standards. Shivaji is at best patronised here and there with a nodding familiarity and spoken of as a familiar underling with the name of “Shiva”. This is not intended, but such is the effect produced. The critical estimate of Shivaji’s character and work in the last seven pages of this work is an appreciative review of the character and life-work of the great King and is, strange to say, quite at variance with the hyper-critical denunciations expressed in the fourteen pages that immediately precede it, and on the whole gives the lie direct to many of the generalizations which are found interspersed in the earlier part of the work. By far the most valuable service rendered by Prof. Sarkar is his vindication of Shivaji from the charge of murdering Afzul Khan. Again he has not fallen into the error of exaggerating the influence of Ramdas Swami upon Shivaji. Indeed he seems to have gone to an opposite extreme and failed to recognize, in anything like a proper estimate, the intense spirituality of outlook which distinguished Shivaji among the nation-builders and rulers of India. Finally, it must be said of Prof. Sarkar’s work that it is arranged in too scrappy a manner to suit the purposes of a serious biography and hence arise the contradictions which are noticed above. In the present work Shivaji is depicted as the director and entrepreneur of the greatest movement for the assertion of national liberty and independence that India has known in pre-British times. His character, his institutions and the greatness of his work are set forth at length in the 24th and in the concluding chapters. The prejudices against Shivaji on the part of the Mahomedan chroniclers are here shown to be of the same sort as those with which the student of Roman History becomes familiar when he finds Roman authors like Livy and Cicero passing uncalled for strictures upon Hannibal. There is indeed a close parallel between these two heroes. Both strove hard for the liberty and independence of their country from foreign aggression. Both were endowed with the most brilliant talents and genius. In both their powers of invention and resourcefulness baffled the understanding and vigilance of their enemies. Both have been denounced by biassed historians for their imaginary acts of treachery and cruelty. But the contrast between the environments of these two conquerors brings out the superior mettle of the Maratha hero. Hannibal had not to make an army, much less to make a nation. Shivaji had to make everything for himself in order to build the Maratha nation. And that he did build a nation and found an empire which lasted longer than the power of Carthage did after the death of Hannibal, is no little testimony to the superiority of the Maratha hero over that of Carthage. It has been the fashion in some quarters to compare Shivaji with great conquerors like Caesar, Alexander or Bonaparte, and a tendency is seen now and then to compare him with ardent but obscure patriots like Viriathus, Vercingetorix or Caractacus, or at best with King Alfred, Robert Bruce, or William Tell. But the fact is that he combined in himself the righteous purpose and patriotic fervour of leaders like Bruce and Alfred and Vercingetorix with the superior military genius and statesmanship that characterized the world’s great heroes like Caesar, Alexander, Hannibal and Bonaparte ; and in so far as these two different sets of qualities characterizing the two groups are found to unite together to a certain extent in the character of Hannibal alone, the latter seems to be the one unique military genius of the ancient world with whom we may compare Shivaji with an approximate measure of accuracy. But the truth is that the character and the life-work of the Maratha hero were both alike so unique, that it is idle to make any comparison. The present work is an attempt to give a faithful likeness of Shivaji and an estimate of his great work, chiefly based upon the indigenous bakhar chronicles of the Marathas. Nearly all the Maratha chronicles have been laid under contribution, together with other authorities, which will be found cited in the foot-notes. Most of these foot-notes are of a critical kind, supplementing, illustrating, and giving the authorities for the statements made in the text. The works of Mr. Kincaid and Prof. Jadunath Sarkar have been of great use, and the latter is freely quoted, especially as regards his citations from the Factory Records in the India Office, which are not otherwise available in India. Of great use have been the writings of Mr. V. K. Rajwade and Rao Bahadur Parasnis, the reports of the Bharat Itihas Sanshodhak Mandali of Poona, the JedheShakavali or Chronology published by the late Mr. B. G. Tilak, and the Itihas Sangraha. It gives a complete account of the career of Shahaji and a critical exposition of his attitude towards Shivaji. It gives a re-constructed version of the Chandra Rao More tragedy. It clears Shivaji from the charge of murdering Afzul Khan. It re-arranges the chronology of the events of Shaista Khan’s invasion, in the light of the Jedhe Chronology and the Mahomedan chronicles. It examines the relations between Shivaji and Dadaji Kondadov and between Shivaji and Ramdas Swami in the light of modern authorities and discoveries. It throws new light upon the naval battle of Khanderi, from British Factory Records and Correspondence, hitherto not handled by any previous historian of Shivaji. It re-constructs the military career of one of Shivaji’s great commanders, whose services have fallen into an unmerited oblivion, — Anandrao Bhonsle (Appendix 2). It re-constructs the career of one of Shivaji’s great plenipotentiaries at the Mogul Court-Ragho Ballal Korde-wrongly charged with murdering Chandrarao More (Appendix 4). It vindicates Shivaji from the charge of cruelty and treachery, by proving that the Mogul commanders were guilty than Shivaji. It gives a new explanation of Shivaji’s so-called plundering campaigns. It discusses the various theories of the late Justice Ranade, Rajwade, Kincaid and others about the origin of the Swarajya movement, its authorship, the relation of the Bhagwat School towards Swarajya and kindred topics. I have to express my thanks to all the authors mentioned above for the assistance derived from their works, as also to Principal G. C. Bhate, Principal Rawlinson, Mr. G. S Sardesai, R. & O. Strachey. Mr. S. Dev, Mr. S. Sen, Mr. Vasudev Shastri Khare, and a host of others whose works have been quoted or made use of in different parts of this book. I have especially to thank the Rev. Dr. N. Macnicol, M. A., D. Litt. of the United Free Church of Scotland Mission, a distinguished scholar and a sympathetic critic, for kindly revising and correcting the MS. and the proofs and for the many valuable suggestions he made which have greatly advanced the usefulness of this biography. The sympathetic “Foreword” which he has so kindly contributed to this work may be taken not only as index of his genuine interest and sympathy in all Indian aspirations, but as a noble tribute to the greatness of our great national hero.